The official opening ceremony was kicked off by Dr. Petra Ponevács-Pana, Deputy State Secretary for Foreign Economic Relations at Ministry of Foreign Affairs and Trade, Hungary, with the participation of prominent government representatives, including Mr. Zhou Xinjian, Counselor, Economic and Commercial Affairs, Chinese Embassy in Hungary, and Mr. Zoltán Balaicz, Mayor of Zalaegerszeg. 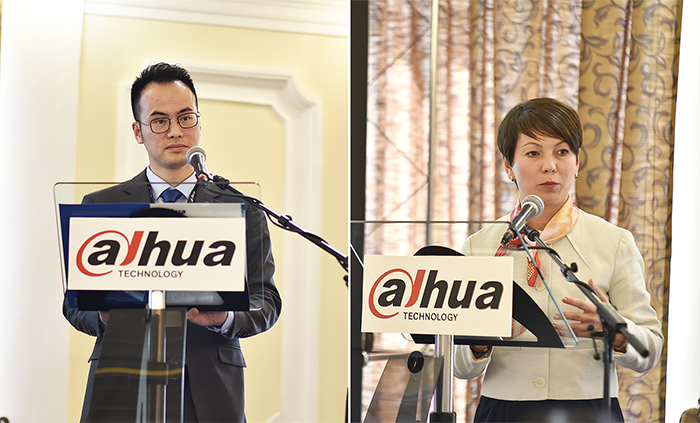 Dahua Technology representatives Colin Wang, Managing Director of CEE & Nordic at Dahua Technology and Jason Zheng, Director of Overseas Supply Centre Operations Management at Dahua Technology were also present with official distributors of Dahua Technology Hungary. Dahua Technology European Supply Centre will supply European markets with better customer service and faster delivery through local assembling and centralized logistics services. The plant is operated by a Dahua partner, who will be responsible for warehousing, production and logistics. In the first phase, the project will start with 3000 sqm and increase with 30-50% within the next two years based on Dahua Technology’s business growth expectations for the future. According to the plan, the production of recorders will go up from the initial 300 pcs to 500 pcs per day, and the cameras with an average 700-900 pcs per day. Regarding Dahua Technology’s distribution activity, by 2020 it plans to set up a distribution hub capable of managing 150000-250000 shipments of devices per month. This project will go live in various phases: it will commence with warehousing and manufacturing. Later customization services, pan-European logistics and procurement services will be introduced. “The Dahua Technology European Supply Centre has a key role in Dahua Technology’s European growth plans. The company sees huge opportunities for further growths in these markets and establishing a local assembly line and logistics centre is a key step to serve these markets in a very competitive way. ” Said Jason Zheng. Globalization is a key strategy of Dahua Technology, and it will be solidified by the growing localization milestones. With a mission of “Enabling a safer society and smarter living”, Dahua will continue to focus on “Innovation, Quality and Service” to server partners and customers around the world. Tagged DAHUA. Bookmark the permalink.